For a country with a relatively small population, Ireland’s best athletes are usually drawn to one of four major sports. While this dilutes the potential of the soccer team to compete on an international level, it does offer young sportsmen and women plenty of different options. 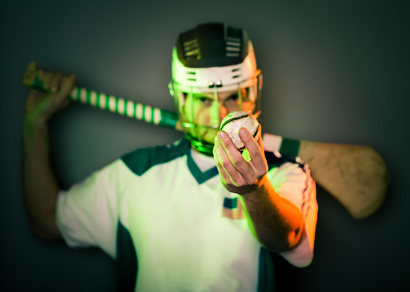 One of the most popular Irish sports is the game of hurling, which can trace its origins back over thousands of years. The sport of hurling appears in ancient myths and legends which predate recorded history in Ireland. The mythical Gaelic warrior-hero Cú Chulainn was blessed with superhuman strength and speed, and famously beat 150 boys at hurling as a youth. Outside of stories, hurling is mentioned in legal documents which go as far back as the 7th century in relation to compensation for sports injuries. Hurling was certainly played widely across Ireland for centuries, despite repeated attempt to ban this sport which – as the Statutes of Kilkenny in 1367 stated – ‘from which great evils and maims have arisen’. What is not clear is the exact rules of the sport, and in fact two distinct versions of hurling were being played before the rules were codified in the late nineteenth century by the newly founded Gaelic Athletic Association. The modern game of hurling features two teams of 15 men (and it is exclusively a sport for men, as the ‘female version’ of hurling is a slightly different sport called camogie) who each carry a stick (hurley) with which they try to score goals and points. A point is scored when the small ball (sliotar) is hit over the bar and between the posts, which are similar to rugby posts. A goal is scored by hitting the ball into the soccer-style goal beneath those posts and is worth three points. Players may move the ball by hitting it with the hurley, or by running along and bouncing the ball on the flat end of the hockey stick shaped hurley. The ball can also be moved either by kicking it or slapping it with the hand. Hurly is a physical sport as shoulder-to-shoulder charges are permitted, and plastic helmets are the only form of protection worn by the players. These days hurling retains huge popularity in certain parts of Ireland, although it is not widely played in every county. The heartland of hurling is in the southern counties of Cork, Tipperary and Kilkenny, although it is also very popular in the nearby counties of Clare, Galway, Laois, Limerick, Offaly, Waterford and Wexford. One of these counties has won every All Ireland Championship going all the way back to Dublin’s most recent victory in 1938. The semi-finals and finals of the competition are held in the 82,300 seater Croke Park in Dublin – Europe’s third largest stadium by capacity – and those games normally attract full houses. Games are televised live on Irish and British television, and despite the fact that all the players are amateurs the games attract high viewing figures and plenty of sponsors. According to the iconic former commentator Micheál Ó Muircheartaigh “Hurling's a game for the gods, and gods played,” and there are plenty of people in the hurling community who would heartily agree with those sentiments.